“Some farmers have been searching for a new crop that can support our families and grow our agricultural economy and many believe they have found such a product, industrial hemp,” Senator Mitch McConnell said during a speech last fall. With bipartisan support and the president’s signature on the 2018 Farm Bill, industrial hemp farming is now legal in the United States. A stark change from what was once a highly criticized crop. In 1937, the Marihuana Tax Act decimated the U.S. hemp growing industry and effectively made marijuana illegal. Thought the act was put on hold during World War II. At that time the U.S. encouraged farmers to grow more hemp. The crop used for ropes, cloth and other textiles would help fill the void left by short supply of other products across the globe. But after the war the crop went back to its taboo status. Now in 2019, the once illegal plant could be America’s new crash crop. “That’s the million dollar question we don’t know how big of an industry this will be,” Dr. James Averill, said. Averill is the Deputy Director of the Michigan Department of Agriculture and Rural Development. “We are getting inquires almost on a daily basis of who wants to start raising industrial hemp or those who are looking at business opportunities with processing,” Averill, said. Right now MDARD is working to establish a hemp farming program that follows federal guidelines and includes oversight and regulation. “We’re looking to stand up a program as quickly as possible,” Averill, added. Which requires working with lawmakers. 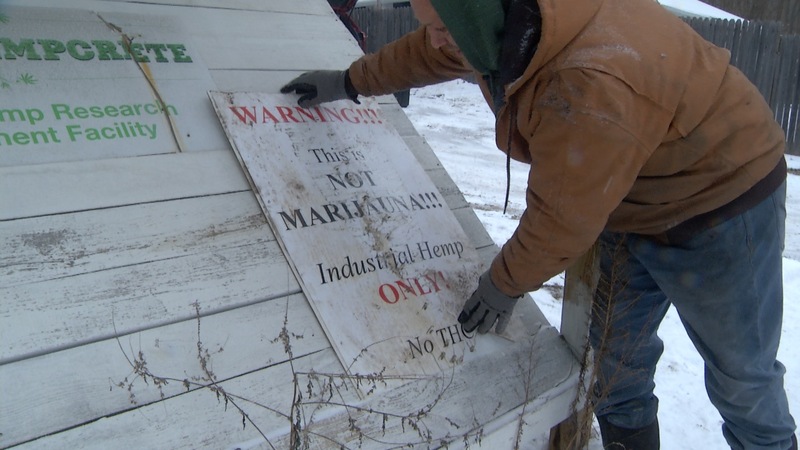 “I’ve been supportive of industrial hemp and allowing, Michigan farmers, not just Northern Michigan farmers, the access to a commodity that will be a net export for michigan to mix into our crop rotations, I think it’s a big deal for our state and I’ll be on the frontlines to try and make this happen,” 105th District State Rep. Triston Cole, said. While the bureaucrats in Lansing work to figure out the licensing aspect, we wanted to see what hemp farming could look like here in Michigan so we traveled to Holy Ground Hemp Farm in Saranac. Joe Brown is a hemp farmer and processors, thanks to special licenses made available in Kentucky, he’s the only one doing it legally here in Michigan. “I had a college partner from Michigan State University who lives in Louisville. We thought, why not apply to the state of Kentucky? So we did so and what do you know we actually got a permit,” Brown, said. “As a result, we were the first ones to do hemp here in the state of Michigan, legally,” Brown, added. Over the past few years, Brown developed a hemp seed genetics program. In nearby Lowell, he processes the plant at the end of spring for products he now sells. He even consults prospective hemp growers, some who are soybean farmers hurt by recent tariffs. “Last year it was about $5000 an acre for industrial hemp, considering soybeans are $800 its not hard to figure out, but a lot of farmers are calling,” Brown, explained. Brown believes hemp is the next cash crop, but says farmers should still take it slow. “There’s a lot of people that are going to want to get rich quick and there’s gonna be a lot of pathways that promise to do that, use caution, start slow and do your research, do your homework. This year, prepare for next year,” Brown, said. With licensing, local farmers could find a lane for future success and less reliance on crops of old. “It’s a viable crop, that is already an existing $4 billion industry,” Brown, added. For more information from MDARD, click here.